Get it right and you’ll be rewarded with increased revenues and lifelong customers. Get it wrong and 89% of customers will stop doing business with you after one bad experience. So how do you deliver the tailored, seamless service customers demand? 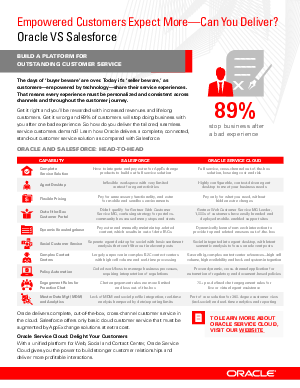 Learn how Oracle delivers a complete, connected, stand-out customer service solution as compared with Salesforce.